After defeating the Minnesota Timberwolves last night, the Golden State Warriors (30-36) will play on the road tonight against the Sacramento Kings (15-39). The Dubs have won both head to head match ups against the Kings this season and will be hoping that their recent success against them is far from being a thing of the past. On offense, Sacramento averages 98.3 points per game (19th in the NBA) on 44.7% field goal shooting (22nd in the league). 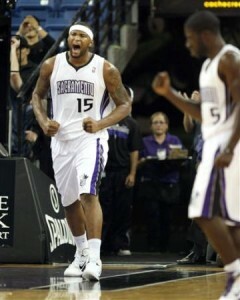 The Kings are able to put up points on the board thanks in large part to their willingness to attack the rim. According to Hoopdata, Sacramento manufactures 24.9 shots per game at the rim (11th in the association) and converts them at a 65.9% rate (10th in the NBA). Indeed, the Kings combine drives to the basket with post ups and offensive rebounding (second in the league with 13.2 offensive rebounds per game) to get interior baskets. This explains why the Arco Arena tenants average 44.7 points per game in the paint (fourth in the NBA) and 24.2 free throw attempts (15th in the association). In their two games against the Warriors this season, the Kings have averaged 110.5 points on the strength of their interior scoring. Sacramento has converted 44-of-70 (62.9%) shots at the basket against Golden State, which has also helped them manufacture an impressive 32.5 free throw attempts per game. Despite these impressive shooting numbers though, the Kings have been unable to come up with a victory against the Dubs. As good as this Sacramento Kings team is at generating and converting shots near the basket, they are a mediocre shooting team. On the season, they shoot 33.6% from three-point range (27th in the NBA), which tends to shrink the court for them. Making matters worse, the Kings get far too enamored with playing isolation basketball; thinking they are in a playground as opposed to an NBA arena. Consequently, they are prone to possessions in which four players get stuck watching the player with the ball as he makes a poor basketball decision that results in a low percentage shot or a turnover. On the season, Sacramento averages 16.0 turnovers per game (28th in the NBA) and 19.7 assists per game. In their two games against Golden State though, the Kings have produced 19.5 turnovers per game versus 20.0 assists per game. On defense, the Kings surrender 104.3 points per game (23rd in the NBA) on 47.8% field goal shooting (27th in the league). They do a good job of defending teams at the start of possessions and keeping them away from the basket, however they have trouble defending long possessions because of their inability to properly rotate out to shooters. The end result is that they allow teams to shoot midrange jumpers for fear of getting beat all the way to the basket. Teams that run screen and roll action can easily get inside the paint for shot opportunities as evidenced by the Kings 46.0 points in the paint per game allowed (28th in the NBA). Indeed, no team allows more shots from 3 to 9 feet than the Kings, who yield 14.8 such field goal attempts per game. And although teams have a hard time getting all the way to the rim against Sacramento, the Kings do foul a lot regardless and thus end up putting teams on the line 25.4 times on average (21st in the league). As bad as the Kings defense has been this season, it’s been worse against the Warriors. Granted, both times the teams faced off, overtime was needed to determine a winner but defense was a completely foreign language to Sacramento players. On the season, Golden State has produced 118.0 points per game on 49.5% field goal shooting against Sacramento. The Kings’ defense has had trouble keeping Warriors players in front of them, surrendering 29.5 field goal attempts directly at the rim thus also resulting in 26.5 free throw attempts. Part of the trouble for Sacramento has been their propensity to cough up the ball against the Dubs defense. Indeed, they are averaging 19.5 turnovers on the season against the Warriors, which has allowed the Dubs to get out in transition and score 30.5 fast break points. If history has anything to say about this game, it should be another thriller that is decided quite possibly in overtime in the last few possessions of the game. So far the Warriors have been able to remain poised under pressure late in games whereas the Kings have been the complete opposite. Sacramento game notes: In two games against the Warriors this season, DeMarcus Cousins has averaged 14.0 points, 10.5 rebounds and 3.5 assists on 36.7% field goal shooting. Golden State game notes: In two games against the Kings this season, Monta Ellis has averaged 32.0 points, 8.0 assists and 3.5 steals on 41.4% field goal shooting. So we’re on the same level as the Nets…and the Cavs? I think the Kings are the worst team in the NBA, DeMarcus Cousins and Tyreke Evans are nice pieces but neither is a player you can truly build your team around.